NIP National internship program Prime Minister Youth Training scheme offering training program only for engineers registered with PEC. This internship program is all provinces including FATA, GB, AJK and ICT for government sami government and private organization through prime minister youth training scheme. The interested and eligible engineers can apply online through www.pmyts.nip.gov.pk or send email for more information info@nip.gov.pk and mobile numbers: 051-9204200 and 051-9244462. 2.5 CGPA or minimum 50% marks in final degree program. Female candidates will be encourage to apply online Pakistani national holders can submit application form. Below information is for normal candidates and above information is for Engineers. NIP News update date:: NIP starts working with Pakistan Engineering Council for providing Internship to Engineers Students, Prime Minister has approved 20,000/- paid internships for young engineers under Youth Training Scheme session 2018. the competent authority has approved the MOU to be sign between Pakistan Engineering Council and National Internship Program. m/o Inter Provincial coordination for the intake of twenty thousand engineers as interns under prime minister Youth Training scheme from Phase III (3) is enclosed for further necessary action by PEC. Dear Selected Candidates of PM Youth Training Scheme Program. Procedure to activate your Asaan Account By National Bank of Pakistan (NBP). 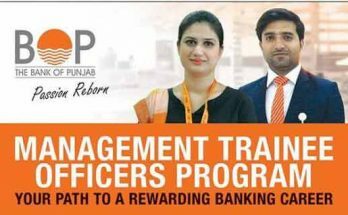 It is only for those candidates Who have submitted their Bank form now they will receive an account Number through SMS send by NBP. SMS Look Like Below.After almost one month. Your Asaan Account Exp (1234567890) has been opened successfully. First of all Visit monitoring.nip.gov.pk for downloading your Placement Latter. After print the placement letter goes to 18 or 17 scale Person like teacher for Attestation form. Next Your actual identity card, whether it be unto you. Attested Photo copy of valid CNIC intern. Attested Photo copy of valid CNIC Next of Kin( Mentioned on online form). Two Attested passport size Photograph if Signature are in Urdu shaky or simple. SS Card Sign (NBP will provide it and Signature must be same as on CNIC ). Print of email Containing Account and Stipend information by NIP. After completion of this process you will get ATM CARD And CHEQUE BOOK. After get ATM and Cheque Book you received your 1st Stipend on your WEB Portal..
Dear Students! The verification process for National Internship Program is now initiated and the last and final end date for verification is , so hurry up verify your record by submitting required documents prior 9th May 2017 in my office. if anyone failed to submit documents he/she may be rejected. Enriching organizations with quality human resources expression of interest of hiring interns under Prime Minister Youth Training Scheme Phase 2. The federal government under the vision of prime minister of Pakistan intends to provide 50,000/- internships to the unemployed educated youth 16 years of education / 3 years diploma ) who will be placed in the reputed public and private sector organizations of Pakistan for the period of one year. 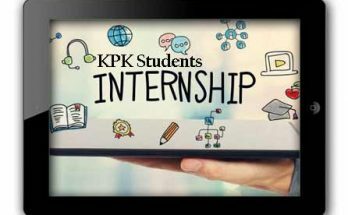 The expenditure on internship will be borne by the government of Pakistan and their would be no liability of any kind on the part of the employer. Besides improving institutions performance prime objective of PMYTS is to provide equal opportunities to the educated but unemployed youth of the country for their professional growth. Interested employers may send their requirements to NIP office though our online portal nip.gov.pk. Helpline: 03311001000 offered by national internship program. Placement email sent to selected candidates. 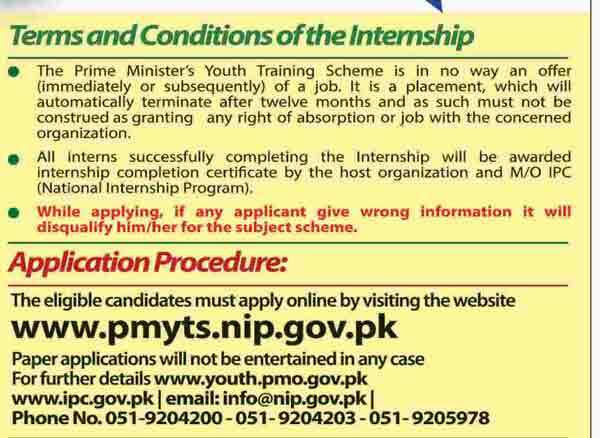 Prime Minister Youth Training and internship Scheme starts under government National internship program ministry of provincial coordination. The online registration starts now, candidates may submit their online applications though www.pmyts.nip.gov.pk , government only accepts online applications paper application will not be accepted. Government of Pakistan offering 21000 opportunities of internship to the unemployed educated youth of all provinces and regions FATA, GB, AJK, and ICT. apply today and get free education with Internship of Rs. 12000/- per month. the program of education is business studies, public administration, social science, human resources development, computer science and MBAs. 25000 Internees will be selected and will be paid 12000 per month. 16 years HEC recognized degree or equivalent / diploma of 3 years after Matric / Fsc 50% marks or 2.5 CGPA in final degree. the age limit upto 25 years old on 30-09-2016 for balochistan 28 years old. the candidates who have awaiting training program under any government youth training program scheme will not be eligible to apply. A Full time student of any university of institute public or private university will not be able to apply. National Internship Program office ministry of inter provincial coordination. Government of Pakistan offering training programs for unemployed educated youth of Punjab, FATA, GB, AJK, ICT and all provinces of Pakistan, Sindh, KPK, and Balochistan. Monthly Internship Amount stipend of Rs. 12000/- per month for one year. The selected candidates will be eligible to earn internship with free training in government /Sami government and private organizations though prime minister Youth program to enhance their skills and employability. The selected interns will be placed in federal ministries / divisions, provincial departments and industries, banks, corporations and various public and private institutions having learning environment for internship. AOA,,,How we can apply? ?Link open ni o ra……..
Kia koi bta skta ha k Kia karna chahie..
aoa when phase 3 selected candidate lists will be displayed? it will be announced soon. currently date is not announced by government of Punjab. December ki stipend kb tk ayy gi ?? Mai nay 2 bar pm youth internship scheme apply kai hai mujy email mai tracking number tu received hoty hai but os sy agy koi process nae ho pata hai? Now i don’t know sir i m selected or not selected again? Kindly sir gauide me what to do i . I am waiting your reply sir . A.O.A please any one help me i’m lost my tracking id thanks! pmyts ki seletion date kab ha or kab se training start hone ha any one koi idea ??? Kya koi bta skta h eska result agya h ya ni?? Jis department k sath bnda attach ho,wahan attendance zarori hy ya ni?? I am born on 15th Nov, 1991, but the online form is not showing 1991 year for Karachi. why I’l be less than 25 years on 05-11-17 but I am unable to apply for this. Is there any chance to apply for this. Sir I have done my MBA Marketing . and i need nip internship job. plzzzz kindly select me for my future…. I m student of B.S GIS 7th semster.. Guide me that can i apply r not.. If yes then how? Dear sir! I want to apply this intership . I have M.A in Islamic studies regular .my CGP IS 3.49 and I have 1st division .PLz tell me how I apply and how to registration for this intership? I need a job my colyfication Matric total marks is 522. Salam sir ,main ne 3 year diploma electric main kiya hua ha or koi kam nei .mjy boht zrurt ha ineternshp ki . Sir I have passed three year diploma of Associate Engineer in civil technology…..
Sir, Main ny do bar apply Kia hy but Mera nam nhi aya Meray dostoun ka nam aa giya hy…. Onky marks mujh sy bhi km thy….. THE INTERNSHIP IS VERY GOOD FOR DIPLOMA HOLDER . i have already apply and i also be received login id but do not received any order letter and not received account message. I have lost my nip portal password what should i do. i have currently no access to portal. Sir I pass the Msc in 2016 and apply for internship phase 1 I am not selected in phase 1 as well as phase 2 internship ,If you guide me about this.i again try in phase 2 but not successfully registered (you already registered in phase 1) . are their any chance of internship call? kya job place hamari marzi ka hoga? It is appreciated that the programe is very good . But the Bank process for achieving the Internee Check Books and ATM Cards should be amended . I mean It would be better if the Internee can collect from the nearest any NBP branch in Pakistan . In the previous phase , the Internees who belongs from Fata , has to collected from Main Branch of NBP Peshawar. I hve already apply BS-CS now can I apply again rpLy . . .? ?